Global Organic Spice Market size was worth over USD 20 billion in 2017 and will witness CAGR over 7.5% up to 2024. Increasing awareness regarding health benefits of naturally produced spices owing to their therapeutic properties will stimulate the product demand over the forecast period. Spices are primarily used for flavoring, preserving, and coloring of food. Predominantly, the majorly used organic ingredients are turmeric, chilies, ginger, garlic, coriander and nutmeg & mace. Strong individual flavors and essence that enrich meals for long range of food applications will remain a key factor driving demand. The rising popularity of exotic and natural ingredients in food preparation owing to their long lasting aromatic properties will further impact the organic spice market growth positively. Spices are an essential ingredient for a wide range of cuisines across the world owing to its garnishing and flavoring benefits associated with it. These ingredients provide pleasant aroma and enriches food quality by adding the balanced amount in the respective cuisine. Surging demand for organic turmeric in culinary, snack items & convenience food, and meat & poultry application owing to its high preservative properties will boost the organic spice market growth. Asia Pacific is noted to play a key role in overall turmeric production and consumption. For instance, in 2014, India produced 13 lakh tonnes of turmeric. It is one of the key ingredients used in most of the Asian savory dishes. The ingredient is also gaining high prominence in international cuisines due to its additional benefits pertaining to counter alzymer will strengthen demand in the coming years. Most of the food processing companies are widely adding organic ingredients in countless applications including canned beverages, baked products, sauces, popcorn, and yogurt. Food industry expansion along with rising demand for RTE food products will strongly instigate the organic spice market growth over the forecast period. Garlic oil has numerous food application owing to its strong flavors that enhances the aroma and gives a pleasant taste in soups, canned food, and sauces. Ginger is also highly used in liquors, carbonated drinks and ginger cocktails which will further strongly support the organic spice market growth. Other benefits such as improving heart health, regulating metabolism and detoxification driving product adoption in various applications. Slow production output in a few regions owing to disinclination among farmers to change traditional farming methods to organic farming may hinder the market growth. Garlic is projected to generate over 2.5 million tons by 2024. Increasing garlic demand due to its high usage to provide aromatic flavours in various dishes will primarily drive the organic spice market growth. China, Korea, India, U.S., Spain, and Argentina are among major garlic cultivating countries. Surging demand for culinary and savoury foods are generating strong demand for garlic in the form of powder, garlic cheese croutons, garlic vinegar and garlic salts. In Asian countries the preference for intense flavours dishes, consumers highly utilize raw garlic to prepare pickles, curry powder & curry vegetables, and meat preparation. Ginger is an aromatic tropical spice used as raw, powder, and oil form in food processing industry. Ginger has gained special attention among owing to its indigenous medicinal benefits opening opportunities for commercial usage. Several food manufacturers offering special products range including gingerbread, medicinal confectionery and premium sauces, which will instigate high product demand. Culinary applications acquire a significant revenue share, accounting for more than 30% of the organic spice market in 2017. High usage of ingredients such as chili, ginger, coriander, etc. on a daily basis for the preparation of side and main course dishes will primarily contribute towards the revenue generation. High customer preference towards these ingredients due to their health benefits pertaining to strong immunity will further strengthen the product penetration. Organic garlic market from snacks & convenience foods will witness growth over 6% up to 2024. The rising consumption of these foods, especially for the young generation will essentially drive the organic spice market. Ready to eat foods will also showcase substantial growth over the coming years owing to high demand for convenience foods, especially in the developed countries across the globe. Asia Pacific organic spice market is anticipated to worth over USD 15 billion by 2024. High production in the countries including China, Vietnam, and India will essentially contribute to the revenue generation. Existence of seasonal variations and several agro-climatic zones will further support the regional dominance. Established agricultural practices along with the presence of high-yielding product variants are other factors positively impacting the organic spice market in the region. Europe organic spice market will observe CAGR exceeding 5.5% over the next seven years owing to a considerable rise in spice consumption particularly in Sweden and the UK. Rising consumption of ethic food along with increasing preference for natural food products will support the industry demand. Expansion in the mainstream retail industry including supermarket chains will drive the regional demand. 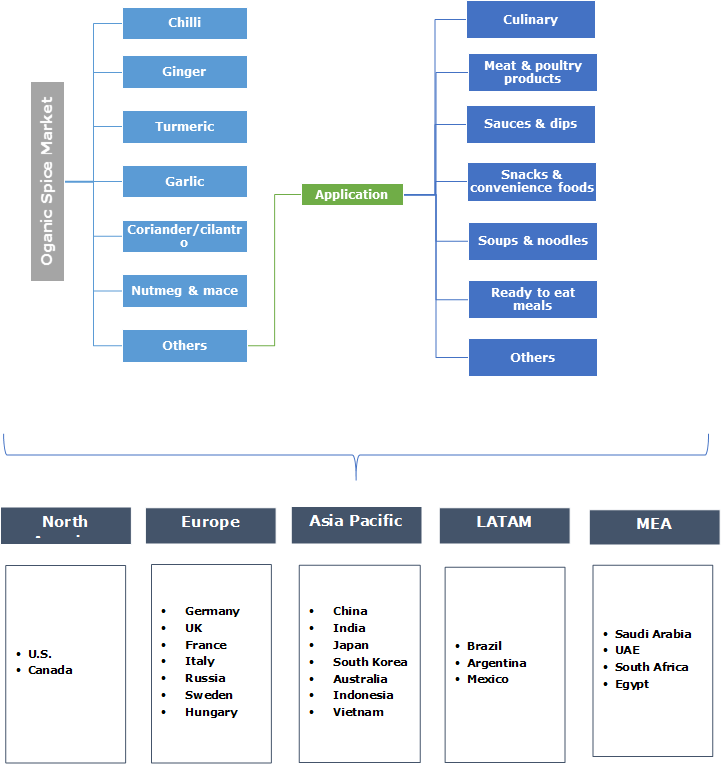 The global industry share is highly fragmented in nature with the major participants, including Rapid Organic, Earthly Delight, Sapthsathi Organic Agriculture Project, Frontier Natural Product, Organic Spices and The Spice Hunter. Other prominent participants include Live Organics, Yogi Botanicals, Starwest botanicals, Salzhaus’l Himalaya Kristallsalz, Rocky Mountain Company, The Spice House and Spices Inc. Manufacturers and suppliers are focusing to integrate supply chain by procuring chemical free farming practices. Moreover, they are incorporating advanced technologies, including steam treatment for maintaining food safety, quality, and food standards. Product innovations to enhance the sustainability and environment friendly properties will support the organic spice market demand. Organic spices are the ingredients that are not subjected to any chemical treatment in livestock food, fertilizers and processing. They are produced with various techniques used in sustainable farming such as mulching, inter-cropping, and integration of crops & livestock. 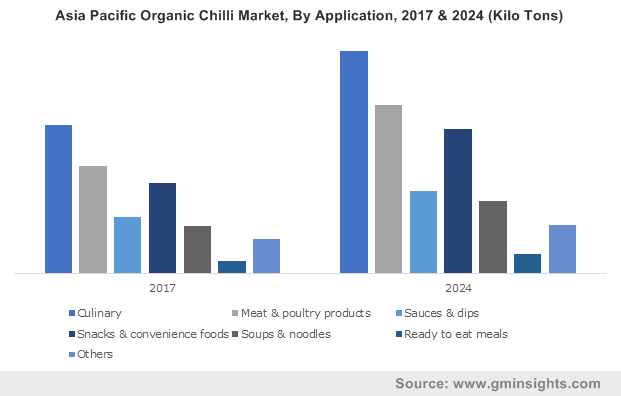 Rising demand from food processing industry coupled with shifting preference towards naturally produced foods will drive the organic spice market growth over the forecast timeframe.